Our research team has discovered a newly crafted malicious program. It goes by the name of Serpent. During its analysis, our researchers have dubbed it as yet another ransomware program that you should terminate if it is ever found active on your personal computer. It is crucial to do so because this devious application functions in an extremely malicious manner. Upon intrusion, it can lock your personal data in a quick way without requiring any authorization. It goes without saying that a loss of personal data triggered by this malicious program could have devastating outcomes. In our report, we provide further information regarding its devious inner workings along with a few virtual security tips that will allow you to maintain a fully secure operating system at all times. Additionally, below you will find a detailed removal guide that will help you terminate Serpent in a quick and easy manner. Serpent exhibits functionality similar to other ransomware applications that are active nowadays. Right after it gains full access to your computer, this devious program will place a copy of itself to the %APPDATA% directory. It will also connect to its server that will help this malicious program to identify the contents of your hard drive. 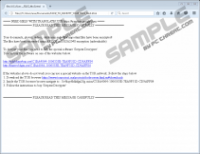 The malicious program in question targets a variety of files on your PC such as .png, .jpeg. .txt, .doc, .docx, .mp3, .mp4, .avi, and quite a few others. All of your data is encrypted using the AES-256 algorithm. This particular cipher is used by malware developers to make manual decryption impossible. Unfortunately, the whole procedure is quick and silent, making it impossible to catch if you are not an advanced computer knowledge. It is also important to note that this malicious program creates a .vbs file that is used to start this ransomware automatically upon each system startup. Right after your data is locked, you will be presented with a warning note that will inform you about the fact that your files are locked by Serpent and that you must pay a ransom of 0.75 Bitcoin, which is about $750, if you want to regain full access to your data. We highly advise you not to make any kind of payment to developers' of this malicious program. This is so because there is no guarantee that cyber crooks will decrypt your data even if you pay up. Thus, you might not only lose a huge amount of personal data but a large sum of money as well. Your best bet to limit the data loss imposed by Serpent is by executing its complete removal as soon as it is discovered active on your computer. To avoid Serpent and have a fully secure operating system at all times, you need to take a few precautionary steps. First and foremost, you must have a professional malware detection and removal tool active on your personal computer. Make sure to install such a tool if you do not have one already. It is a crucial part of your overall virtual security as it is fully capable of detecting any potentially malicious content on your PC or online. Alongside such a tool, we firmly recommend practicing safe browsing habits. This means that you must refrain yourself from all suspicious third-party download websites since they are known to host a number of bundled installers, which are infamously used by malware developers to spread their invasive software. Also, you should be extra careful about all of your e-mail attachments since your malware experts have discovered that this malicious program is often distributed disguised as an important e-mail attachment. By taking these seemingly simple precautionary steps, you will make your operating system virtually unbreakable. The complete removal of Serpent should not be delayed under any circumstances. To completely stops the malicious functionality of this malware you must delete its every single bit. Leftovers of Serpent could be used in devious ways. Our research team has discovered that in some instances they could be more than enough for this malicious program to function. 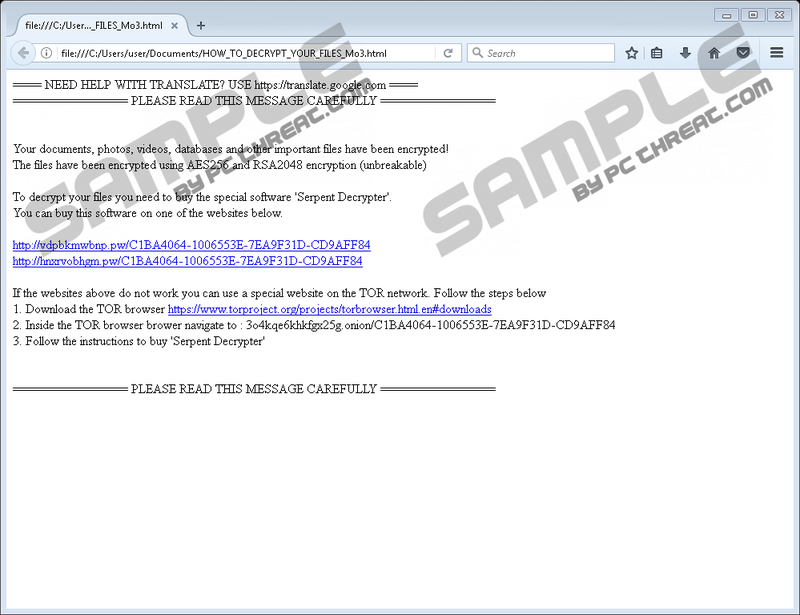 In other situations, those same traces might be used to silently restore this ransomware. By conducting an extensive analysis of your operating system for leftovers linked to Serpent you will be sure that the removal procedure has been successful. If you find manual removal and analysis a bit too complicated, we advise you to use a professional antimalware tool to delete this malicious program in an automated manner. Right-click a folder that host the Serpent executable file and select Delete. Keep in mind that the name of this file is random. Select the malicious .vbs file and then remove it. Keep in mind that the name of this file is random. Quick & tested solution for Serpent removal.